I confess quite openly to my guests, I am a lazy gardener–at least when it comes to flower gardens. It’s not that I don’t enjoy floral beauty. It’s just that, for now anyhow, there’s only so much time and a lot of other tasks are higher up the TBD list. Yet despite my confession guests are nonetheless impressed by “the flowers”. 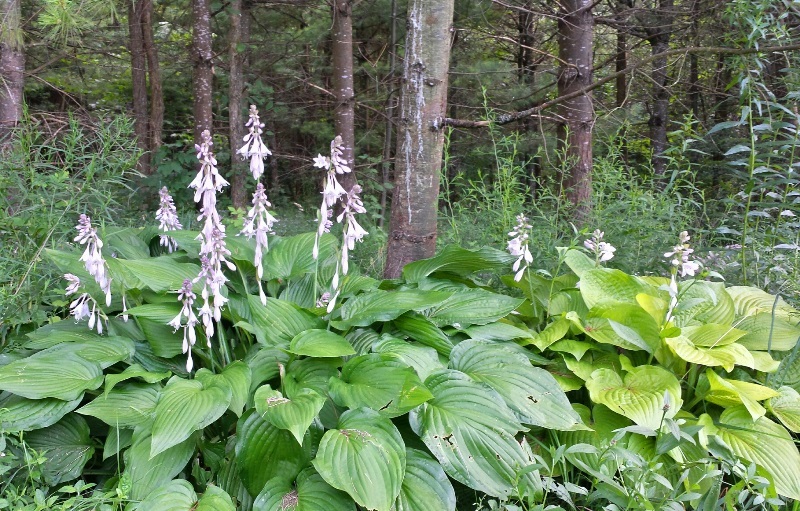 The Lazy Gardener’s next best friend: Hostas! The flowers they are enjoying the sight of are hollyhocks… which, so methinks, are the lazy gardener’s best friend. You do, well, basically nothing and this amazing stem of flowers comes up in a variety of colours in mid-to-late July every year. They self-seed, they are hardy, they are awesome. All for zero work. This year in particular (see banner picture above, taken today) thanks to all the rain we have been having for weeks (and weeks and weeks) some of the hollyhock stems are getting on for 8 feet tall!.